Schools have become the epicenters for pushing propaganda and various political agendas. Schools are not educating children to think critically or to become life long learners. School should be preparing our youth to become productive citizens not activists. What we must have is more learning in schools and less activism. Asperger’s syndrome is technically no longer a diagnosis on its own. It is now part of a broader category called autism spectrum disorder (ASD). Those with ASD tend to have “an obsessive focus on one topic or perform the same behaviors again and again.” Greta’s obsessive focus is on climate change. 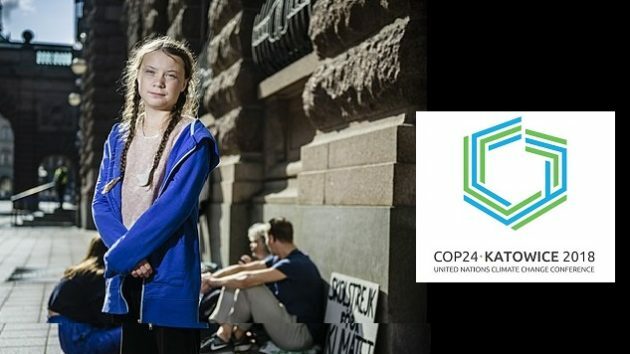 Greta is being used to push the environmentalist agenda of climate change at the United Nations Climate Change Conference of the Parties (COP24) conference in Poland. Conference of the Parties COP24 reflects 25 years of saturating the world’s youth in the dogma of global warming or, as we now refer to it, climate change. They have been told all their lives that humans (their parents) are killing planet Earth with all of our modern conveniences. Of course, the most advanced economies of the world are the most guilty of this crime with the United States being the worst offender. One young Swedish girl, Greta Thunberg, learned about the crisis of global warming when she was 7. She was so concerned she quit talking or eating and became ill. She is now 15 and acts as though she carries the weight of the world on her shoulders trying to stop climate change. She has been skipping school one day a week or striking, as she calls it, to bring attention to this crisis. This has made her a celebrity in Sweden. The fact is, according to satellite readings, Earth’s temperature has been in a pause for the last 20 years and has had no significant additional warming. Furthermore, Don Easterbrook, Professor Emeritus of Geology at Western University, is one of several scientists who say the Earth is cooling. Prof. Easterbrook predicts Earth’s temperature will cool 3/10th’s of a degree Fahrenheit over the next 20 years and will continue that cooling trend for several decades. She has had an audience with United Nations’ Secretary-General, Antonio Guterres, as well as other heads of state telling them “they are behaving like children.” She is being used as a pawn by the U.N. to further their cause. What adult can resist the impassioned plea of a child asking for help? President Trump has pulled out of the Paris Climate Agreement. He has said that he is “not convinced” about global warming/climate change. It is clear that Greta is being used. It is clear that the United Nations wants to push it’s climate change agenda and is more than happy to use Greta as their pawn to do so. The problem is implementing the UN COP24 agenda harms human flourishing and especially children. Just look at Paris burning to understand the social cost of the UN agenda. Macron followed Greta’s advice and now he faces its consequences on his own people. Climate change is just a smoke screen for the U.N.’s hidden agenda to have a centralized government giving it the ability to globally regulate and redistribute wealth from rich countries to poor countries and of course, itself. The global warming lie has deprived the youth of the world the hope of a prosperous future. That hope has been replaced with fear. President Trump is showing great courage and true leadership in pulling the U.S. out of the Paris Agreement and questioning the whole human-induced global warming claim. EDITORS NOTE: The edited featured image of Greta Thunberg is by Marc Femenia from Wikipedia. The notion that climate change has slowed in the past 20 years is completely in error. The warmest years in the climate record occured in 2014, 2015 and 2016, the first time that we’ve had three record years in a row. 2018 is likely to be the fourth warmest year. The most recent cold record was around 1912. I am a Ph.D. scientist and have carefully read and analyzed climate science for the past 30 years. 3. There is nothing mankind can do to change these natural cycles. They are set and immutable. Nearly all scientists agree with Greta. The idea that anyone should use President Trump as a source of science is a complete joke.